Can you help this care home dog get his much-needed double hip operation? He has given comfort and companionship to the residents of “his” Lochaber care home. And now, the community has taken its chance to repay William the dog by fundraising for an operation he needs. William has proved a big hit with the residents, day care clients and staff at Invernevis House care home in Fort William since he moved in during February of this year. But they have now discovered that he needs an operation on both hips that is expected to cost more than £10,000. The home issued an appeal via social media for a four-legged friend after Henry, a dog that belonged to one of the residents, John Crooke-Gayford, died. And they were contacted by Claire Buchanan from Keith, who rescued William from Cyprus through the Give a Dog a Bone charity two years ago. 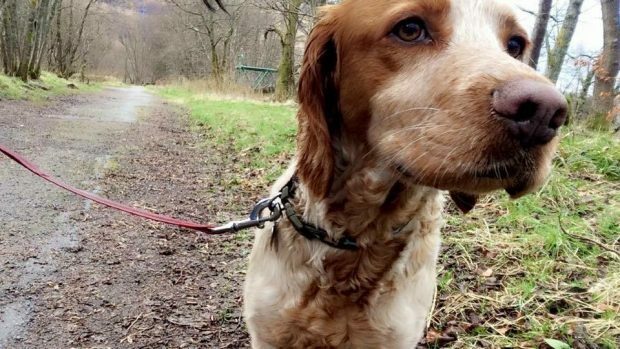 The rescue spaniel, who spent his early life as a street dog and is believed to be aged about five, immediately settled into his new environment and seemed to enjoy all the attention he received there. Care home manager Kit Cameron said: “He now needs operations on both hips and the insurance won’t cover it as he has had the condition all his life. “He became slightly more active when he came here and it may have contributed to the flare-up. She explained that William accompanies the staff taking the medication trolley round, especially at night, to say goodnight to all the residents. He also goes out on the day care bus to greet those coming into the home for the day and staff and local volunteers take him for regular walks. Mrs Cameron said lots of people have been offering to raise money for him, but they have decided to get a second opinion before going ahead with the operation. She said: “We have to think about what’s best for William, whether the operation is really necessary or whether he could continue with a comfortable life without it. Lucille Brooks, who works at the home, is looking for sponsorship for the sober October challenge, which means she cannot drink any alcohol for 31 days. And Liz Macmillan, of Caol, is selling items on a social networking site to raise money for William’s operation.